I’ve been going to Arisia (one of Boston’s Science Fiction Conventions) for several years. I always have a great time, and it always amazes me the amount of volunteer effort that goes in to providing amazing programming for everyone. This year I wanted to give something back so I came up with the idea of people building rayguns. Regular LED strip is super cheap when you order it from China. 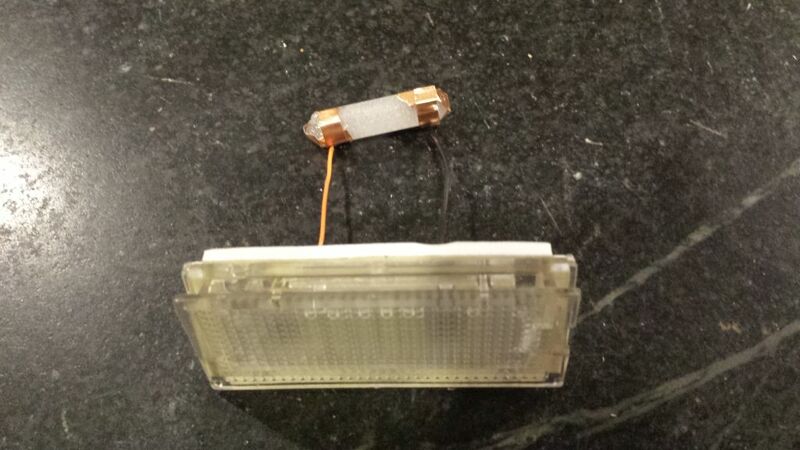 It normally runs off 12V, but a 9V battery lights it up just fine. I created a simple laser cut frame to put some LED strips, and then some cool laser cut acrylic disks to give it that groovy 50’s raygun look. I bought most of the parts myself, but special thanks goes to my friend Jeremy Green at Charles River Maker for donating Laser time for cutting the kits. He’s your goto guy for design, prototyping and digital to physical services with laser cutting and lots of 3D printers! A switch makes the trigger, and there’s a fin with holes to add decorations. Line up the battery clip and shorten the leads to connect one end (I chose the red, positive wire) to the positive contact on the LED strip. A small wire went from the negative contact to the switch and the other lead of the switch to the negative lead of the battery clip. Next line up the disks where they fit. back them off and put a drop of superglue where each disks goes in order. And now a few pics from the workshop at Arisia! Is 3D printing good for anything practical? 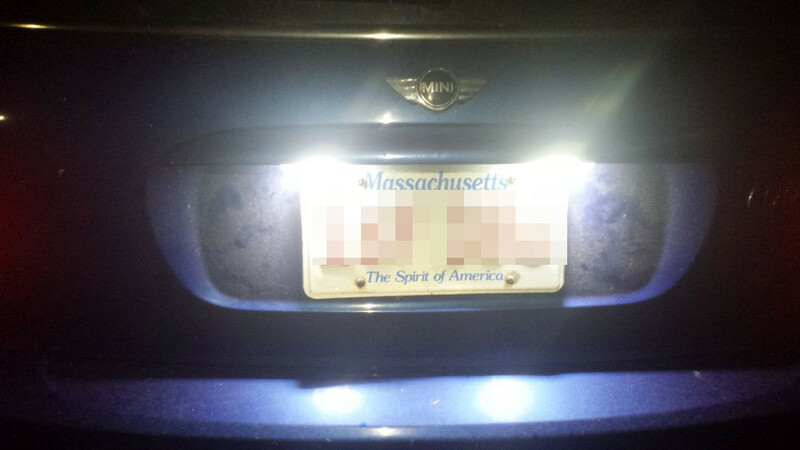 When I took my Mini Cooper in for it’s annual state safety and emissions inspection it failed because one of the tail lights was out, and the license plate lights were, well really out. One of the lenses had long ago fell out, and the other bulb was dead. When I looked on line, the cost for a couple of lenses and the bulbs was greater than a complete unit with LEDs (never replace again!) so I ordered a pair from ebay. They came, but the contacts wouldn’t make connection with the bulb holders. I communicated with the Ebay seller, and they were great, offering me a refund or to find the right bulbs for me, but I was impatient. It didn’t have to be pretty it just had to fit and hold the contacts in place. For contacts I wrapped the ends in copper tape, and soldered wires between those and the light fixtures. Note, that it’s easier to solder to any delicate surface if you use liquid flux. Hopefully it will pass inspection tomorrow. Of course if I didn’t have all this stuff at home, it totally wouldn’t have made sense to do this, but I do, and it was actually a fairly fun and easy project. YouDoIt Electronics is a terrific local resource, carrying tons of Sparkfun and Adafruit products (as well as tons of mechanical and electrical parts, educational toys, AV equipment, you name it!) Thanks Melissa and John for sponsoring me! Spoiler alert: in part 3, we finally succeed! If you read the first post you know that I was inspired by all the cheap replacement parts for the Syma X5. Also the motor mounts have all sorts of interesting attachment points, including a tube that fits a 3mm (who knew they were a standard size?) bamboo barbeque skewer. I’ve seen people bodge together quadcopters with “real” controllers but with crappy wooden frames, so I thought why not. 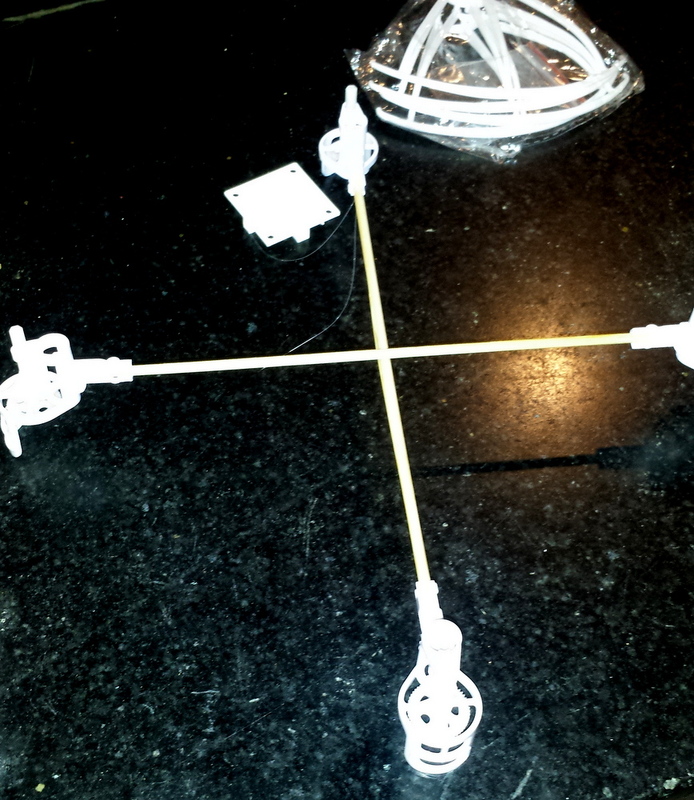 First I cut some skewers so the props were centered where they were in the original Syma X5. They were 9 inches center to center. I taped it all together, with the controller in the middle. I didn’t have much hope, as you can see the fit on the motor mounts isn’t tight, and I was afraid they would twist. I taped them the best I could but as you can see in the video it was a total fail. One problem I noticed, was that I had mounted the controller board upside down. Doh! The purpose of the controller is to keep it upright! Next I designed a 3D printed hub for the middle, secured with hot glue. I found some tiny screws (scavanged from many tear aparts!) and drove those through holes in the arms and through the bamboo skewers. This time it worked better but spun. I concluded that the bamboo was twisting with the motor torque. Probably true, but later I also discovered that I had the motors mounted in the wrong place. 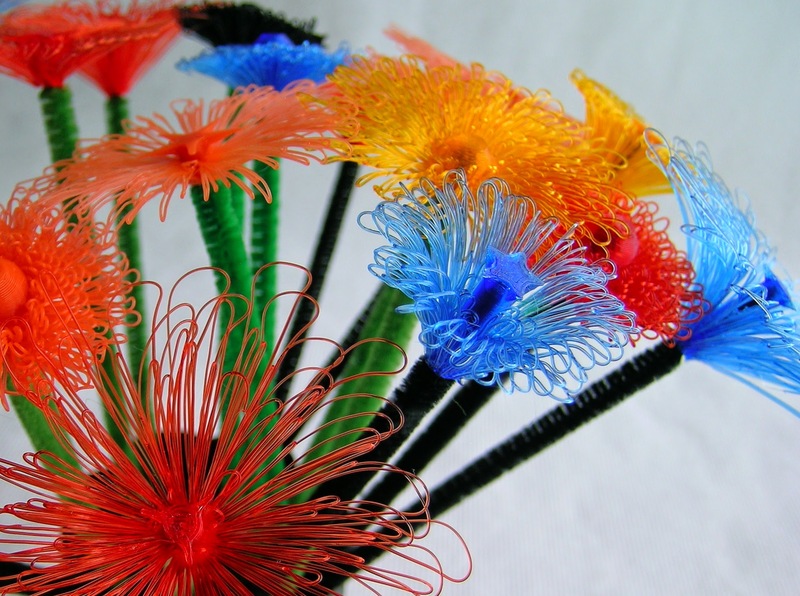 Mark Peeters, came up with a clever idea for making lacy fibrous flowers with a 3D printer, by taking advantage of FDM’s greatest weakness: the need to support overhanging structures. The trick is that you have to let them droop down, so you have to have something in the center to hold it up, and have the legs be unsupported. I designed in support material for the body. 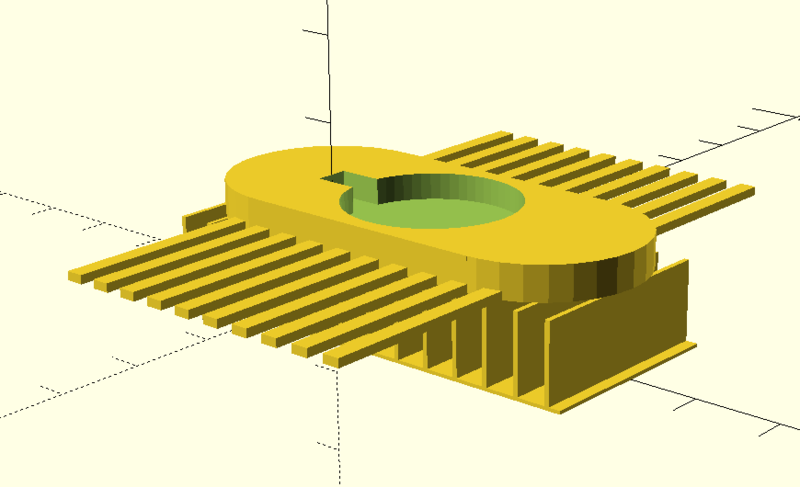 It’s tricky if you make the support walls to thin, the slicer may ignore them. Too thick and it’s harder to remove. This version works fairly well, but is a little too heavy for my taste. 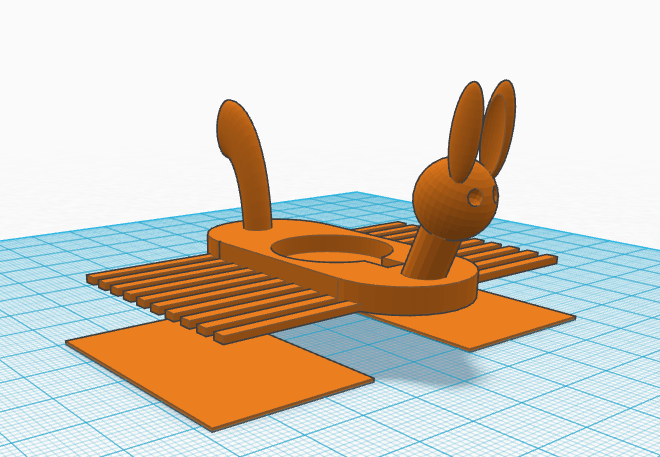 This works out quite nicely, and gives a speedier print. After printing, I use a hot air gun to soften the legs to press them down more to a right angle. This give a more energetic movement than the splayed legs right off the printer. You can also experiment with trimming them with scissors. 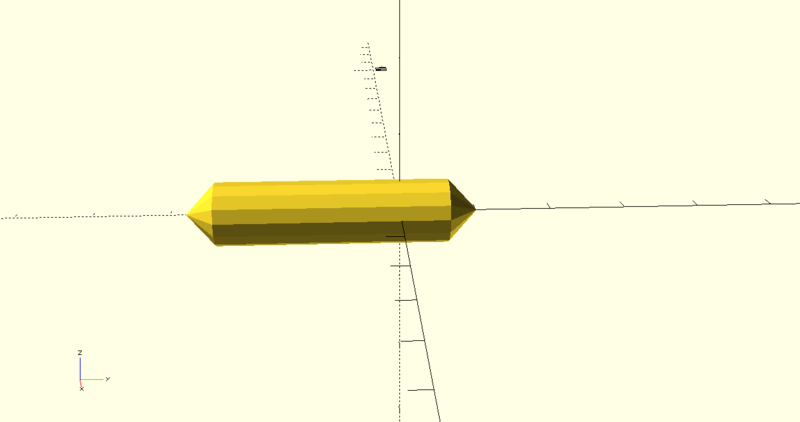 Last but not least, I imported the basic STL into tinkercad, and added a head and tail for a little more pizzazz! Nano quads: is the Cheerson CX10A a good way to learn? 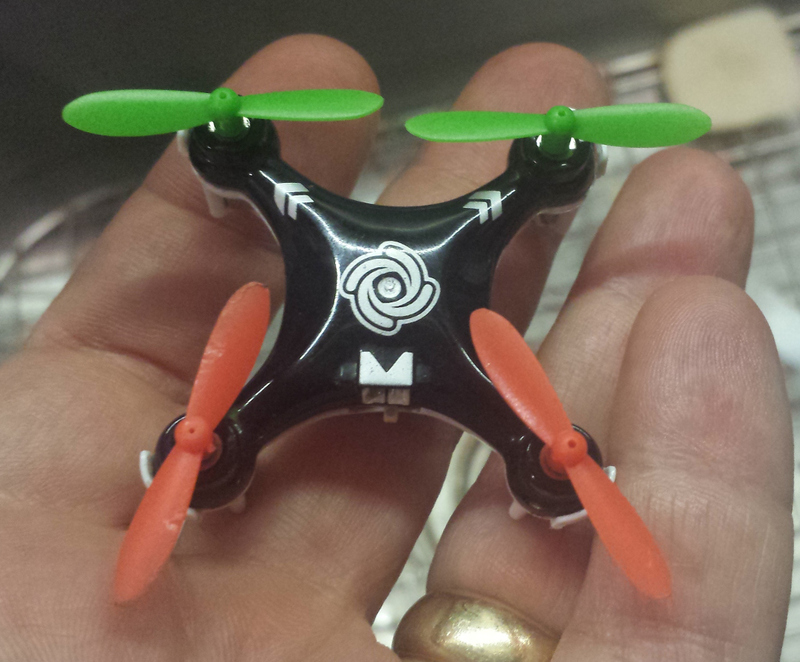 Continuing the quadcopter obsession, It’s hard not to run across the myriad of nano and mini quadcopters out there. They are cute, and offer the opportunity to fly indoors. My neighbor who flies a DJI Phantom 3 Pro said he learned on the Cheerson CX10. 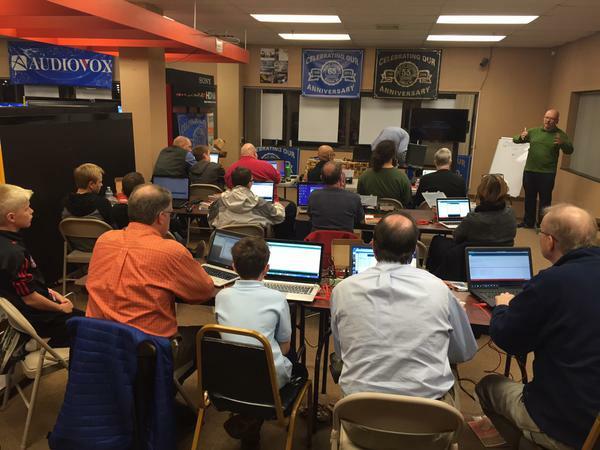 I ordered the upgraded version (CX10A) from BangGood in China, and while I was waiting, I saw them in action at Einsteins workshop in Burlington, MA at a robotics meetup. It looked really fun and their local quadcopter enthusiast made it look easy to fly, however other folks had a bit of difficulty. Note, you can also buy it from Amazon for only a couple of dollars more and have it in two days! Well, it arrived, and it certainly is cute! Being tiny (though not the smallest…) It has a very small battery, and it’s inside the case soldered to the board. While the sites advertise replacement batteries, it’s not an easy swap. You’s have to cut the connector off the new battery (Be careful!) and solder it to the board. It comes with a little USB plug charger that charges it in about 30 min. My flight times were initially longer, but now I get about 5-6 minutes without prop guards. It doesn’t come with prop guards so I 3d printed some from designs on thingiverse, and later ordered an aftermarket propguard that was much lighter. Let me say this: It’s all about the thrust, and I’m afraid the tiny props just don’t provide a lot. Without propguards it flies reasonably well, though it’s not going to win any awards for turning quickly. 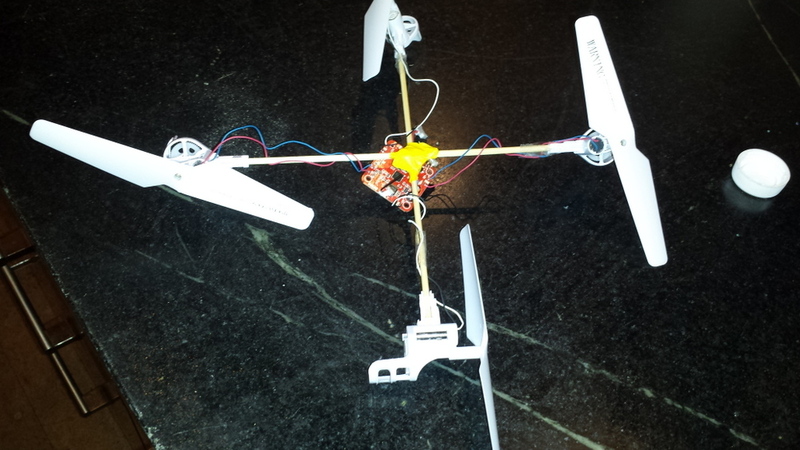 With the prop guards, it has significantly more inertia, and no more thrust, so it tends to be a bit more jerky. It falls faster, stops slower, and in general is hard to fly. Not a great thing for a beginner learning to fly. 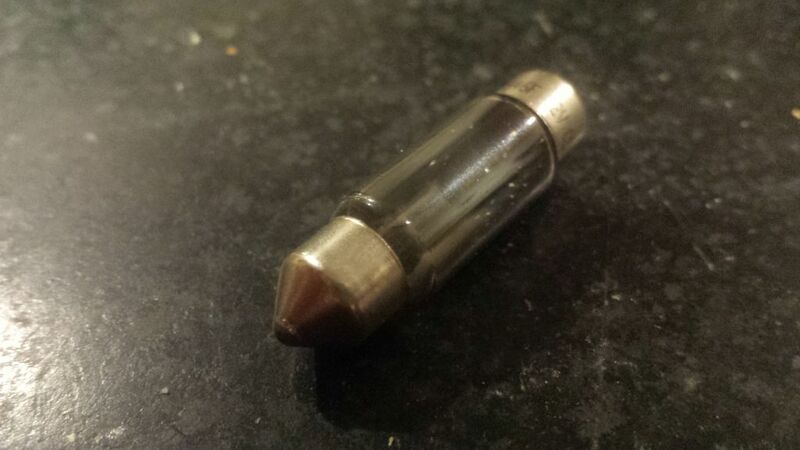 Also keep in mind, this thing is tiny, and you can easily loose track of it. It also has an acrobatics mode, if you push down on the right joystick, and then push it in the direction you want it to flip, it will execute a nice flip for you. Don’t do this too near the ground (or other people…) as it’s likely to lose some altitude in recovering from the flip. When I got better at flying it, and was taking it outside, I thought it was broken. It would stop turning in one direction, or just suddenly I’d lose control. I noticed that up close, I didn’t have these problems, but 20 feet away, yuck. 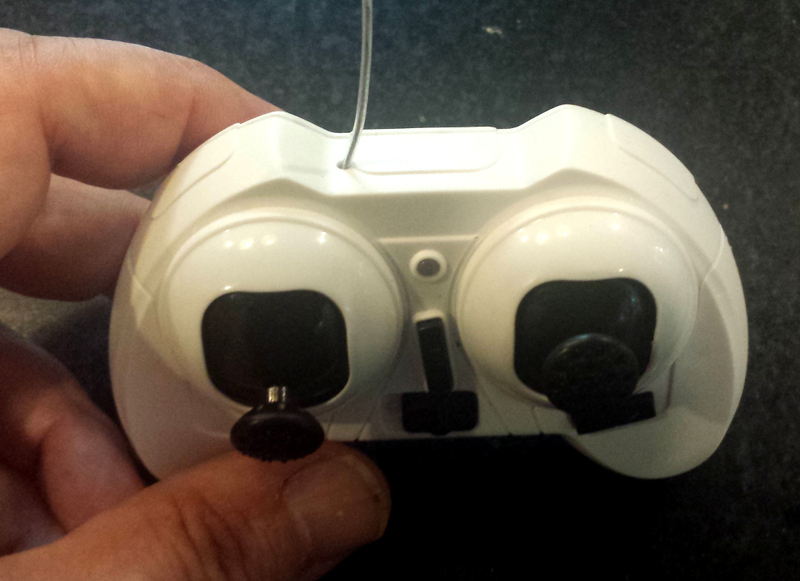 I’d seen some youtubes where people extracted the little wire antenna on other quadcopters and their controllers, so I cracked open the controller, drilled a little hole in the case and fed the wire antenna through, and now it behaves great! I can fly it at least a block away. 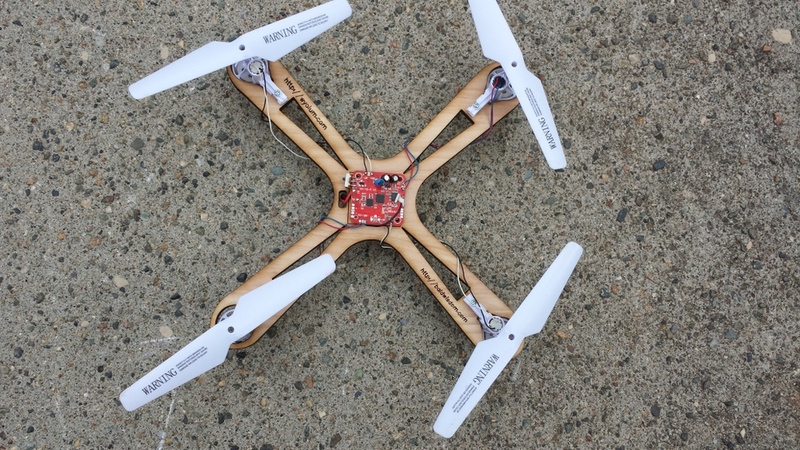 Don’t bother cracking the copter itself open to do the same thing, as there is no wire antenna, it’s just built into the PCB. The CX10A differs from the original CX10 in that it has a “headless mode.” Normally when you fly a copter away from you (back of the craft toward you) Left is Left and Right is Right. If the copter is flying toward you, it’s reversed. If you push the stick left, the quad will go right, and vice versa. 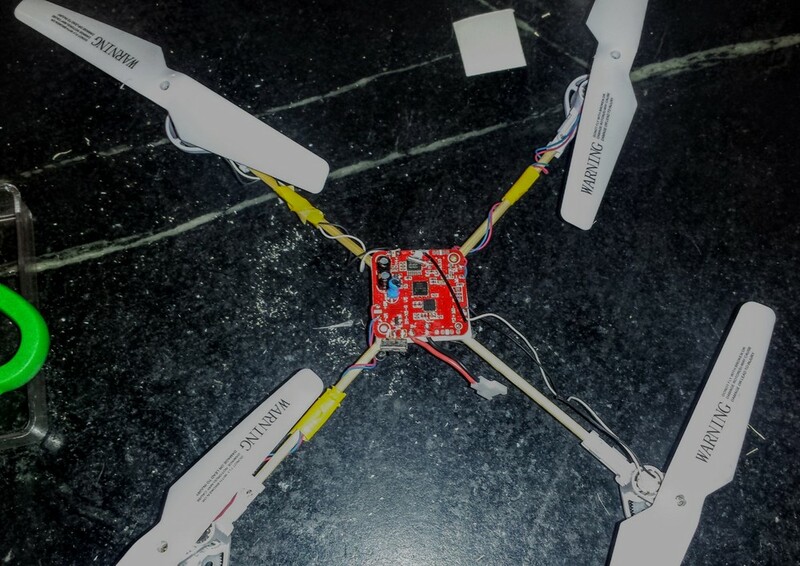 In more advanced quadcopters, a special “headless” mode is implemented with an electronic compass, that allows whatever direction you take off in to be the “normal” direction. now, no matter which way you fly, the quad will go Left when you push left, and Right when you push right. On the CX10A, they try to do this by keeping track of turning (it does have a gyroscope sensor) in software. It works….For a while, until it gets confused, and then you have to turn the copter off, and re-pair with the controller. Also, any bump or crash, makes it either go crazy (one or two motors on full speed) or just stop responding all together. 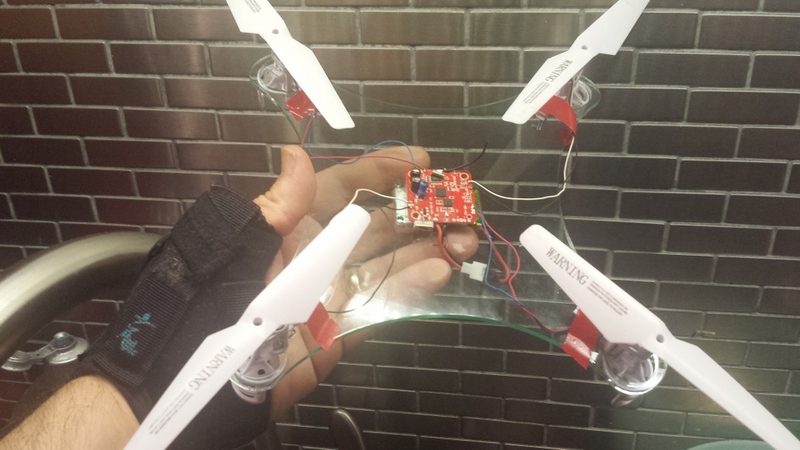 It’s a fun toy, and once you learn to hover relatively well, it’ fun to fly it from one person’s palm to the next. It’s a bit flakey when it crashes, and is underpowered, so I really wouldn’t recommend it for learning to fly. 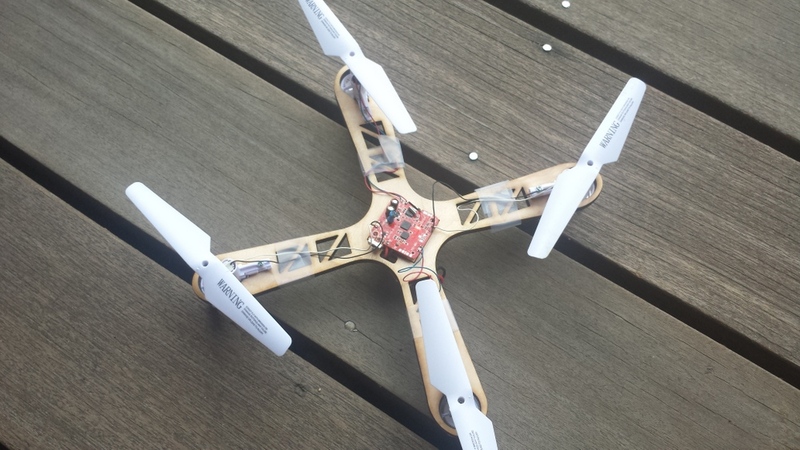 A larger copter, (even a mini, like the Hubsan X4 or the Eachine H8 which I’ll review next) are more agile flyers. I don’t have any other Nano-copters to compare it with, but the bigger ones are easier to fly in general. 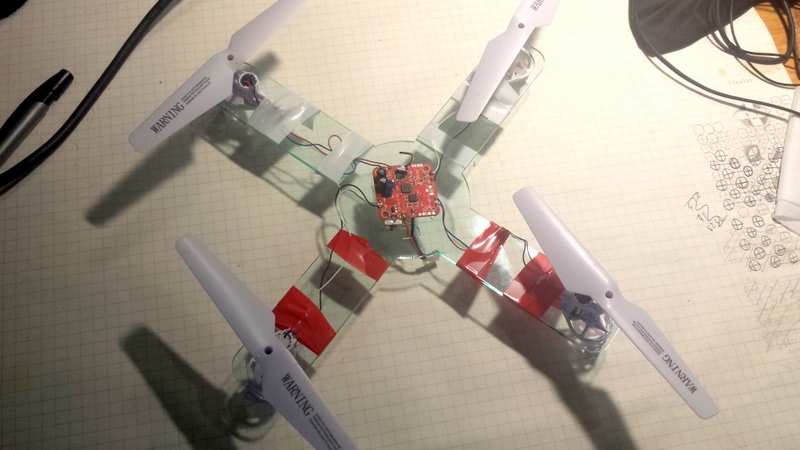 The nano size can be more readily flown indoors (with even my poor flying ability!) but you should watch out for crashing and you are going to have to clean things like hairs out of the props it if lands in an untidy corner.